In metalworking and jewelrymaking, there's always some metal waste, and goofs. Over a 2-3 year period, I accummulated a bunch of sterling bezel settings that the stones wouldn't fit into anymore. I had over 50 sterling bezels that I had to scrap. They sat in my sterling scrap container for a while and every few weeks, I would sort thru my silver scrap for any usable silver. I pulled out all the bezels, looked at them, and started arranging them into patterns. I add sterling square wire for extra detailing, and by the time I got finished soldering all the bezels together, I had 5 funky pendants. Now, I wanted to fill in the bezels, so I thought of using my enamel powder. I had bought 5 boxes of enamel ( glass grounded into fine powder) and all the tools needed for enamelling years ago. Now, I find doing enamelling ( fused glass on metal) tedious, so I don't do it except as demos for class which is not often. I took clear 2 part expoy, mixed assorted colored enamels and filled in all of the bezels. 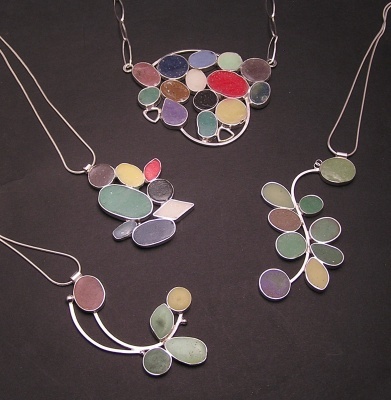 I tried to arrange them in a pleasing color scheme, like the browns, greens, yellows and purple for the flower-like pendants, and bold, graphic colors for the more abstracted pendants. Once the expoy was cured, I sanded down the resin as it is called, to even out the surface. It gave a flatness that I liked since it made the pendants more stylized. I actually liked what I achieved in my pendants, so I'm going to try to make more of the resin-filled pieces. You just never know where you will go when you experiment. That's the part I like to do.